Gold is closing out 2018 with a flourish. Prices are poised for the biggest monthly gain in almost two years as concerns about next year’s economic outlook, volatility in global equities and a government shutdown in the U.S. spur demand for the metal as a haven. Spot bullion hit a six-month high on Friday, topping $1,280 an ounce, as investors favored defensive assets, adding to holdings in exchange-traded funds over the month. Silver rose to the highest since August as it approaches its 200-day moving average, which could trigger further technical buying. Banks including Goldman Sachs Group Inc. have flagged the potential for gains over 12 months as the Federal Reserve steps back on the pace of U.S. rate increases. As the final week of the year closes, there was a slew of downbeat economic data and outlooks from the U.S., China, Japan and Europe. Gold is powering into the year’s end as global equities sink in the fourth quarter. 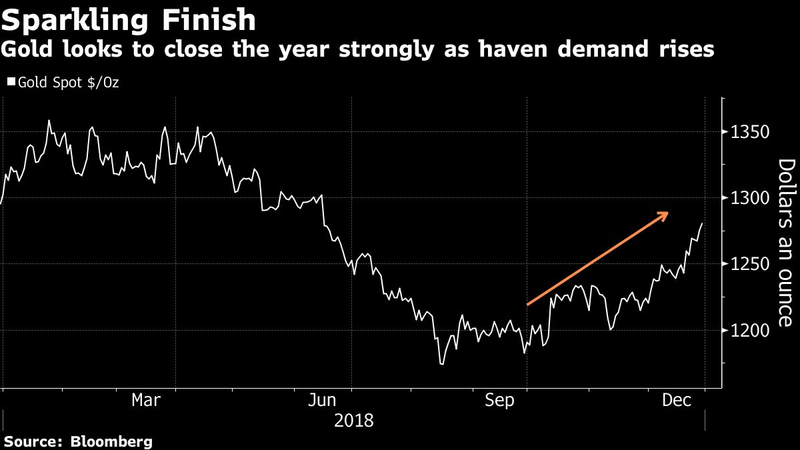 “We are very optimistic on gold,” said Benjamin Lu, an analyst at Phillip Futures Ltd. “There’s still a lot of uncertainty and gloom toward 2019.” Macro concerns, the U.K’s Brexit process, and high levels of borrowing are among risks that will aid bullion in the first quarter, according to Lu. The metal will probably stay volatile in 2019, according to Richard Fu, head of Asia & Pacific at Amalgamated Metal Trading Ltd. in London. The metal may trade in a $1,150 to $1,375-an-ounce range as bullish and bearish drivers compete, he said. Spot gold advanced as much as 0.5 percent to $1,282.23 an ounce, the highest price since June, and traded at $1,277.65 at 8:25 a.m. in New York, according to Bloomberg generic pricing. It’s up 4.7 percent in December, on pace for biggest monthly rally since January 2017. China: The economy slowed for a seventh month in December as the trade war, subdued domestic demand and decelerating factory inflation undercut growth, according to a Bloomberg Economics gauge. Japan: Factory output dropped in November, the sixth contraction in eight months. US: Consumer confidence slumped in December to the lowest since July as a gauge of labor market expectations fell by the most in 41 years. Europe: The European Central Bank expects the global economy to slow next year as rising protectionism curbs trade growth. In Washington, the partial U.S. government shutdown is likely to continue into 2019 after House Republicans said on Thursday they didn’t plan any votes this week and as the president sought to blame Democrats for a stalemate over funding for a wall that a majority of Americans don’t support, according to polls.